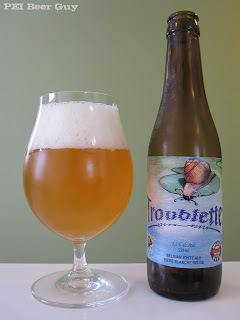 This Belgian Belgian white ale / witbier is the first of two beers I recently got from the Caracole Brewery / Brasserie Caracole. It is advertised as having 100% organic Pilsner malt and raw wheat, as well as Styrian and Saaz hops. It was also awarded a gold medal at the 2002 World Beer Championships, with a rating of "exceptional". The head of this beer is pretty impressive, but it doesn't have a lot of stamina. The bubbles within it start to combine and pop soon after pouring, leading to a modest covering on top of the beer. It's still a nice-looking head, though - fluffy-white like beaten eggs. There is no real lacing of note. The colour is like a slightly cloudy version of a muted apple juice. Golden, with a flatness to the colour. The aroma of it is similar to the Dominus Vobiscum Triple I had a couple of days ago - yeast, a hint of wheat, as well as fruit notes thrown in like apple, or sharper citrus (maybe a bit of mango as described by a review or two I have read, but it could be several different tropical fruits). The fruit notes lean on a bit of the sour side. The taste is a bit of a surprise compared to the smell. It's a bit of a departure, and lighter than I thought. There is something to it that gives me thoughts of "unripe". Perhaps it's its slight acidity. It does have a fruitiness to it. I would describe the fruitiness as a mix of toned-down wild apples from my parents' yard and something like green grapes - maybe not quite green grapes, but darn close, whatever it is. There is definitely a bit of spice or coriander in there as well. The body of it is somewhat light, and is smooth. I found the carbonation a little strong. Overall, a decent beer. I wouldn't go out of my way to get one, but I wouldn't turn down the chance to try one, either.